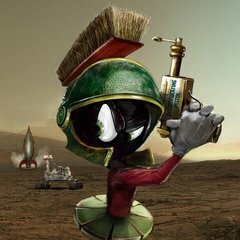 hi all, just wanted to drop in and say hi. 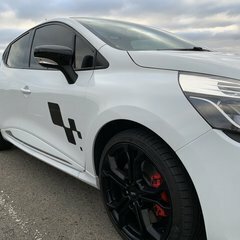 I've been snooping around these forums for a month or so whilst i tried to find a clio sport. I've wanted one now since released so about 18 years! Yesterday i finally put down a deposit on a silver 182 Cup. The Price was too good to pass up given the condition (albeit does have a couple of qn marks mechanically..) Bit unsure if this is the appropriate place to address my "qn marks" but it would certainly put my mind at ease if other forum members could chip in on a few things: 1.) it seems to have a drone from the rear of the car, i've read here wheel bearings are a common issue so leaning this way. Just unsure if it could be something really nasty? 2.) a small rattle from rear (i'm actually not very stressed about this so unsure why i'm even noting it!) 3.) i have seen the members here suggest only buying a car with a good service history and confirmation around items such as the timing belt... I'll be honest the logbook in this one was less than perfect and was unable to confirm when the timing belt was done. The owner is going to check with his mechanic around this. I am simply going to assume i need to get it done prior to really driving the car (i'm in no rush) as it has 178XXXkm on it. Otherwise she all looked good bar aircon that doesn't work and auto wipers that don't! can't wait! pic attached for viewing pleasure and look forward to meetings and all the contacts/resources here. A quick hello! 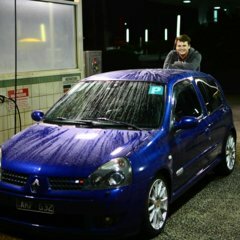 Just picked up a Clio 197 supposedly for my son, but I suspect I'll be having more fun in it. I've had a range of cars including a couple of Alfas. In recent years though, an NB MX5 which I turbocharged and a few Hondas which I still have. The DC2 Type R is a stripped out, track only car and the FN2 Type R is road registered weekend toy with a K-frank in it. Very torquey, very easy to drive but oriented toward smooth roads and track days. And that brings us to the Clio. 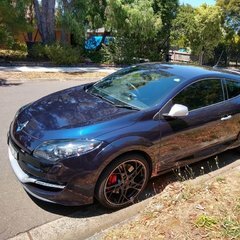 Picked it up in Singleton, and had a run through the back roads on the way back to Sydney. It's ultimately not as quick as the Civic, but I had so much fun it! A couple of things need attending to (engine mount, shocks wearing out, and steering rack bush) but MAN it was fun and so easy to drive. The car is at Renotech now getting the engine mount and drive shaft seal attended to. I'll slowly get to the suspension and steering rack...can't wait to get it back! I have to say though...much fewer 197s around than I expected. Picked this one up about 6 weeks ago. Absolutely stoked with it. Very usable car (it's my daily), much more compliant and refined then I expected based on some reviews I'd read. Love the pops and bangs from the exhaust, the seats, heaps of features etc. Great car! Plus I just got it Opti-coated too which has made the paint way better than it was. Couldn't recommend it highly enough. Hi guys, Just brought this. 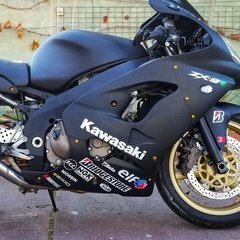 Not looking at track days, this will be my daily. 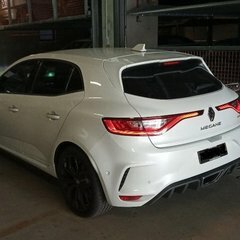 Hey Guys, As of this evening, I placed a deposit on a Jet Black Australian GP Edition Megane RS250, and should collect later this week all going well. 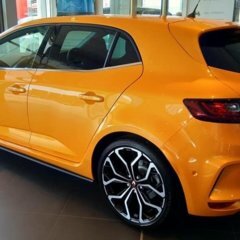 I've actually been a long time Renault fan, although this will be my first actual Renault car owned. Can't wait to pick it up and enjoy it! Thanks for having me here. As promised, Out with the old... In with the new! I've only had the car a few days but I'm loving it.The suspension is more compliant than my M140i.The handling is sharper as well.I really need more driving time with the car.The acceleration pick -up is very good not to mention the crackling sound of the exhaust note.I am also very inpressed with the fit and finish of the car.I used to work at Ford and I know what to look for. Anyway just a very short review and a picture,I will post more in regards to my review of the car as I do more Klms. No, that looks normal, all sticky and shity looking. Hi everyone. I'm Peter and I'm the proud new owner of a 182. It's a little weapon! It's going to be raced in Improved Production so I'm all ears for cost effective ways of making these things faster. The whole idea is bang for the buck racing in a fun category. The car itself is a bit tired but it's already great to drive. Early plans are cage, gearbox rebuild, a straight through exhaust, powerflex black bushes, Ds3000 pads and some coil overs. Any recommendations between Konis or Bilsteins for racing? Need to be able to be serviced/revalved, preferably in Aus. Any fancy shiny parts won't be on this car. If it doesn't make it faster, I'm not interested. My other cars are Gp S Alfetta GTV, NC MX5 and V8 Hillman Imp sports sedan. My Insta ID is RaceBreakFixRepeat, so that's where build pics will be. Going to do YouTube build videos too. Fun!! 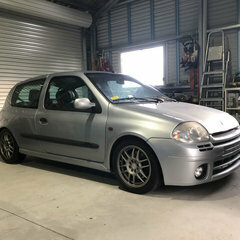 IMHO pay a bit more (closer to $5,000) and get one with a good service history that's been well maintained -- brakes and pads, fluids (brake, coolant, power steering), both belts including tensioners, water pump etc, engine mounts, and tyres well suited to the Clio like PS3 or RE003s. Their famous handling and character is very much dependent on tyres. Otherwise whatever you buy you'll need to spend another $3,000 doing the engine mounts, belts, tyres, brakes and fluids to get it up to scratch. Don’t forget to come to the 2’s on 2’s Clio ll meet on the 2nd of Feb. 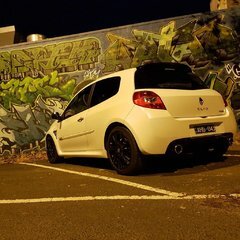 The first﻿ "2's on 2's" annual Clio ll me﻿et in Melbourne open to all 172 ph1, 172 ph2, 182, 182 Cup, 182 Trophy and V6 is on Saturday 2/2/19 at 5:00pm , Yarra Bend, Loop Picnic Area. 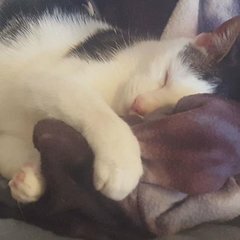 htt﻿ps://www.google.com/maps/place/Loop+Picnic+Area+and+Playground/@-37.7987676,145.0093195,17.83z/data=!4m5!3m4!1s0x6ad643a6799a6425:0xe773dcfdc350067b!8m2!3d-37.7987578!4d145.0104701 It is the o﻿﻿pposite side of the Yarra from Studley Park and entrance is obtained from the north side of the Eastern Fwy. At thi﻿s point we will be ﻿meeting here, bringing some snags, steaks and drinks and talking Clio ll's for a couple of hours. It is a family friendly venue for kids or dogs with the playground next to the bbq area as well as the walking paths and foot bridge over the Yarra to Studley Park. We will be going for a cruise after we finish up here for those who wish to come for an easy drive somewhere beach side. Les?, How do you pronounce your name? Hi guys. You’ll notice that the forum logo as of a day or so ago has a fresh look. Good news is that we have stickers ready to go with the same design. Will get a pic uploaded ASAP.